August 16th – 18th, 2019, RSVP deadline is July 30th, firm. We can’t wait to Welcome You Aboard! For the first time, the Icebreaker Mackinaw Maritime Museum Board of Directors and staff will host a reunion of former crew. 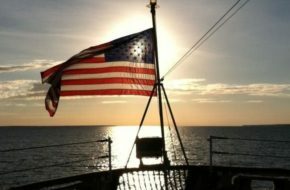 In order to be a bit more inclusive, we have opened it up to other Coast Guardsmen who want to spend time with those who served aboard our beloved ship, the “Queen of the Great Lakes”. Oh, the stories you can tell! Those of you who attended the last reunion in 2014 may have received a survey after that event. After reading the comments we found that the vast majority wanted a 2-day casual event where there are many opportunities to visit with each other. We encourage you to bring along, and share, your memorabilia from your time in the USCG. So that is what we are going to do! Some of the events will be right here on the dock or on the ship. 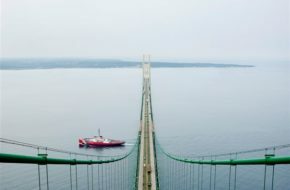 We’ll add in a tour of the “new” Mackinaw if they are available. We plan to conduct short video interviews of former crew as they tell a bit about their time aboard the ship. This would be great material for us to use as part of telling the story of the ship and those who sailed her. Please make note of your interest on the registration form. As you know, Mackinaw City is quite geared to tourism. We hope that you will go to our website www.themackinaw.org and take a look at our Business Sponsors page. Please visit those businesses that support our museum and its efforts. We are looking forward to a time of good food, good fun and good friends. We hope to see you here! If you have questions, please call our office at 231-436-9825 or email me at lisa@themackinaw.org. Videography – Tell us your story! *A cash bar will be available at the Welcome Reception and at the Dinner Buffet.